Two varieties of cardamom plants are identified, and they are Elettaria cardamomum Maton, variety Major composed of wild indigenous types of Sri Lanka and Elettaria cardamomum Maton, variety Minor comprising of cultivars like, Mysore, Malabar and Vazhukka. These types are grown in different tracts and are mostly identified on the nature of panicles, size of plants and other morphological characters. Cardamom varieties are highly location specific. High yielding varieties of cardamom released include ICRI 1,2,3:TDK 4 &11;PV 1,PV 2, CCS 1 Mudugiri 1;NCC 200; MCC 12,16 & 40. ISSR Vijetha is resistant to Katte disease and is reccomended to moderate rainfall with moderate to high shaded Mosaic (CMV) infected areas. 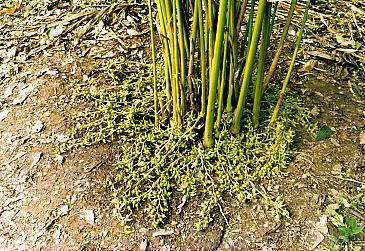 IISR Avinash is resistant to Rizhome Rot and is highly suitable for planting in village. 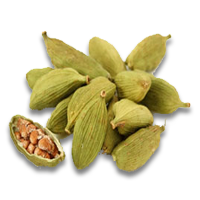  These cardamom plants have medium size and attain 2-3 m height on maturity.  The dorsal side of leaves may be pubescent or glabrous.  The panicles are prostrate and the fruits are globose to oblong shaped.  Better suited to areas of 600 to 1200 m elevation.  Relatively less susceptible to thrips.  It can thrive under low rainfall and seasonal rainfall conditions.  This type is mostly cultivated in Karnataka and to a lesser extent in Kerala and Tamil Nadu.  Plants are robust and attain 3-4 m height.  The leaves are lanceolate or oblong-lanceolate or glabrous on both sides.  The panicles are erect and the capsules are ovoid bold and dark green in colour.  Thrive well under assured, well-distributed rainfall conditions.  Mostly cultivated in Kerala and in certain pockets of Tamil Nadu and Karnataka.  This is considered to be the natural hybrid of Malabar and Mysore types and consequently, the plants belonging to this group exhibit various characteristics intermediate to Mysore and Malabar types.  The plants are robust like Mysore type.  Leaves are deep green, oblong-lanceolate or ovate, panicles are semi-erect (pendent) in nature and capsules are bold globose or ovoid in shape.  Extensively cultivated in Kerala and Tamil Nadu at elevations ranging from 900-1200 m above MSL. Mudigere-2 : It is also a Malabar type and clonal selection, released during 1994, the average yield of M-2 is 475 kg/ha, with non-pubescent leaves and panicles are not compact with good quality capsules. P6 : This clone having recorded higher dry matter accumulation and leaf area index consistently over years, is found promising as a drought tolerant clone. CL-730 and CL-692 : New Cardamom clones selection from germpalsm collection were found promising by recording 1.57 and 1.53 kg of green capsule yield per clump respectively as against Mudigere-1 (1.2 kg) and Mudigere-2 (1.4kg). The clones CL-692 have been proposed for farm trials during 2001-02. CL-D-237 : A new clone developed from open pollinated seedling progenies was found promising. The average yield of green capsule per clump was 1.80 kg as against 1.40 kg in Mudigere-2 and 1.20 kg in Mudigere-1. Among the several clones studied, clone Mudigere-1 exhibited relatively low genetic variability. Hence, seedling progenies of this clone could still be used when clonal material is not available for scale planting.